Let’s take a look at our recommendations for which of the Mircale-Gro AeroGarden pods is the best fit for you to buy. There are a good amount of choices to pick from & some can get a little pricey, so it’s good you’re making sure you’re getting one that fits your overall goals. The AeroGarden Elite Bounty Wi-Fi is a premium countertop hydroponic system that allows beginning hydroponics growers to enjoy the benefits of a passive, touch-button hydroponics system from the comfort of their homes. Grow herbs and microgreens easily from your countertop and all the information that you need to be able to maintain your passive hydroponics system are all there. 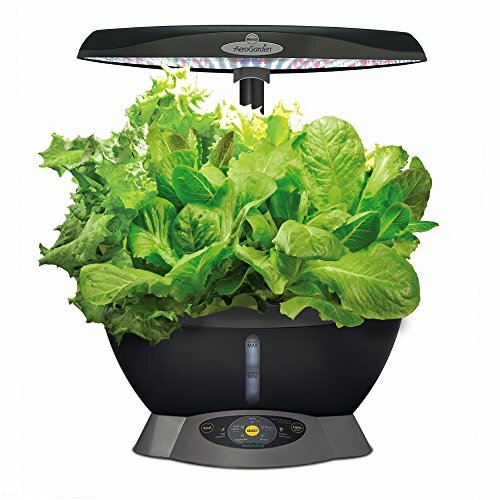 AeroGarden Bounty models are intelligently designed so that the machine does all the measuring for you – you only need to add nutrients to the nutrient solution as needed whenever the balance is tipping. Another interesting feature of this countertop hydroponics system is that it can be linked to a smart device via WiFi so you can monitor and control its electric features easily from your phone or laptop. 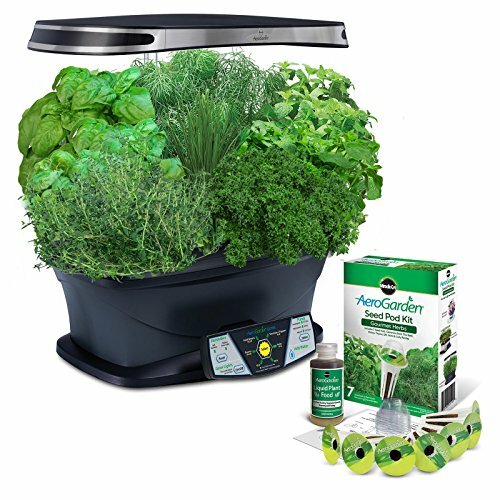 The AeroGarden Bounty with Herb Seed Pod Kit is the classic model from the AeroGarden Bounty series that features a nine-pod capacity for a total of at least nine plants (this still depends on what kinds of herbs or microgreens you’re interested in actually cultivating). What’s interesting about this type of hydroponic farming is that you won’t be doing much measuring or maintenance at all as the machine does all the measuring for you. This will take away all the usual difficulties encountered by beginners when they are trying hydroponics for the first time. The system comes with its own 45-watt LED lighting system, and all seeds that come with the countertop system are guaranteed to grow with what has already been provided by the manufacturer. So all you really have to do is plug in your machine, drop the seeds and watch them bloom. Also perfect for teaching kids how hydroponics works! The AeroGarden Ultra LED With Gourmet Herb Seed Pod is a slimmer version of AeroGarden that despite its slim appearance, can still carry a hefty capacity of seven pods at a time. In contrast to the Bounty model with no WiFi, this one is the next best choice as you will be getting more or less the same system minus just two seed pods. A toned down 30-watt lighting system is included in the system, which is perfect for seven grow pods. The lighting included in all AeroGrow systems have been optimized to maximize photosynthesis in plants. Generally speaking you will not have to wait for long for your first harvest when you initiate your passive AeroGarden hydroponics system. Herbs and microgreens all grow fairly quickly and in a week or two, you will already have a thriving system where harvestable greens are available for shakes, stews and all sorts of dishes. This is one of the reasons why the AeroGarden series is fairly popular with many households. Greens offer nutrition and great taste to shakes and other food items and you can harvest them directly from a clean hydroponics system any time you want. Gardening really never looked (or tasted) this good! 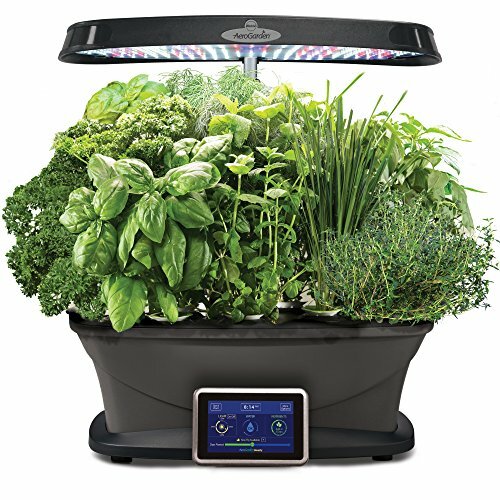 The AeroGarden Extra LED with Gourmet Herb Seed Pod (also called the Miracle-Gro AeroGarden Extra LED) is another slimmed down version of the AeroGarden Classic model that can handle up to seven grow pods at a time and is equipped with a reliable 30-watt lighting system to hasten the growth of all herbs and microgreens. The intelligent interface of all AeroGarden systems do not just inform you about the nutrient level state of your plants – they also tell you what to do, what to add to the system and when to add them. So as you can see, a lot of guesswork is removed from the equation and you’re really better off with a smart system like this if you are just starting out with hydroponics. This product also comes with its very own Gourmet Herb Seed Pod system that contains Genovese basil, Thai basil, curly parsley, chives and dill. These are all classic herbs used for a wide assortment of local and international dishes. If you’ve ever wanted to taste these herbs fresh from the plant itself and add them while you are preparing food, then this would be a great time for you start your very own hydroponics system right from the comfort of your home! 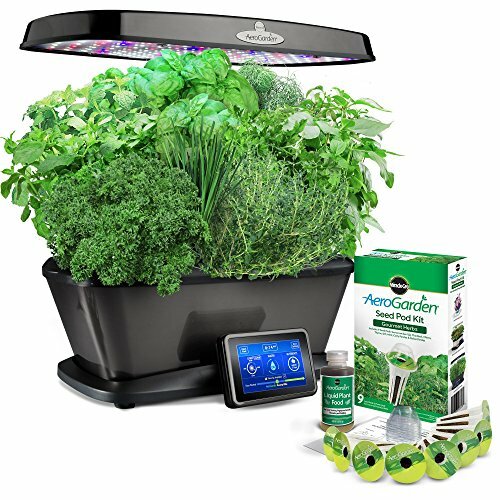 The AeroGarden 7 LED Indoor Garden with Gourmet Herb Seed Kit is likely the most petite of the units available in the Classic line of AeroGarden and comes with all of the best features that has made AeroGarden a household brand all these years. What makes this particular unit attractive, apart from its ultra-sleek appearance is that it has a seven-pod capacity but only runs on 20 watts of LED grow light power! Normally, table-top passive hydroponics systems require between 30 to 50 watts of power in order to work. The way this system is designed is it only needs a fraction of the usual power, but you will still be able to grow plants five times faster compared to their counterparts planted on soil. The reason for this is that as the pants grow in the passive system, the root mats gain leverage by being exposed to plain air. The oxygen exchange improves and this greatly hastens the growing the rate of the plants themselves. The AeroGarden Classic 6 With Gourmet Herb Seed Pod is a most petite variant in the Classic series that has a six grow pod capacity and has been equipped with a 20-watt LED grow light that provides more than enough energy for your plants to grow rapidly. You might be thinking – well, 20 watts isn’t much, right? But that’s the difference between LED grow lights and conventional LED bulbs that were designed to illuminate interiors. They have been designed to provide a specific range of frequencies that help increase the photosynthetic action of plants, which then improve the growth rate like never before. 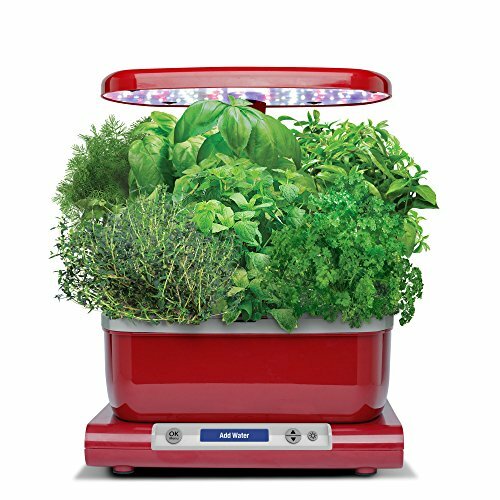 For a tabletop system, the AeroGarden classic series sure works hard to bring those herbs and microgreens to life. And yes, you will still get the intelligent control panel included in the bigger models. In addition to receiving monitoring updates about the state of your hydroponic garden, you will also receive timely tips that will help in the maintenance of your system. The AeroGarden Harvest with Gourmet Herb Seed Pod Red is larger and badder than the slim/petite versions of the Classic series. We recommend this particular model for folks who want the same feel of conventional gardening, minus the soil and bugs. Done in a shimmery red finish, the red Harvest has a six pod capacity and comes with an amazing touchscreen LCD control panel that automates several processes related to the growth of your plants, including the scheduling of the LED grow lights. Despite its size, the AeroGarden Harvest comes with an energy-saving 20-watt LED grow light that still provides ample lighting to increase plant growth in as little as seven to fourteen days. That is just two weeks from the initial setup of your AeroGarden! That means in just a week, you will already be harvesting from your touch button hydroponic system. 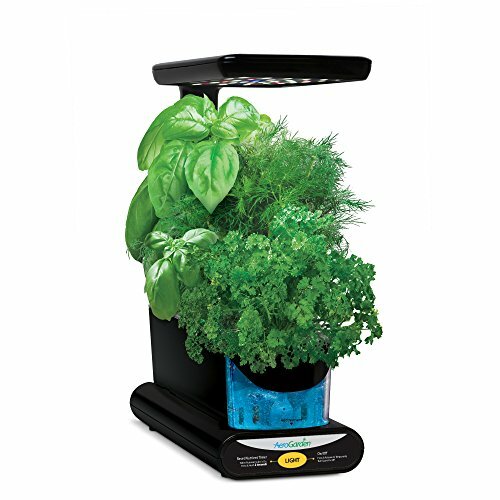 The system comes with its own herb seed collection that includes basil, parsley, dill, and even mint. All AeroGarden models also come with a patented nutrient mix that’s easy to mix and add to the existing solution to make your garden bloom and grow like never before. The AeroGarden Harvest Touch With Gourmet Herb Seed Pod Kit is a prime model from the AeroGarden series that features a towering LED grow light attachment plus a full, stainless steel body fit for any contemporary home. The stainless steel build assures utmost durability and longevity and guarantees long service and life under normal use. Choose this model if you are interested in growing more than just microgreens and herbs. With models from the Harvest series, you can grow a variety of plants like tomatoes and larger plants easily. While it can be placed on a countertop, you may place it elsewhere if you are expecting to grow larger plants that exceed the usual height of average herbs like dill, basil and oregano. 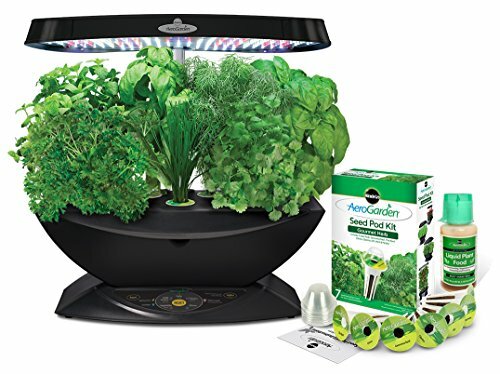 The AeroGarden Sprout LED with Gourmet Herb Seed Pod Kit is a top of the line model designed for folks who want a sleeker and more compact look for their passive hydroponics system. 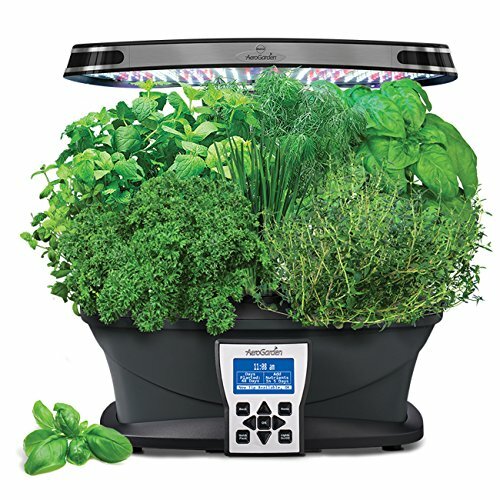 If you are not planning to plant more than 3 herbs or microgreens at a time, then this model is perfect for you. Compact and sleek, it will sit perfectly on your countertop and provide the same level of satisfying indoor farming that is the genuine stamp of all AeroGarden hydroponics systems. This model comes with its own 10-watt LED grow light system that has been redesigned to maximize the viability of photosynthetic action in the system. Miracle-Gro AeroGarden units can be purchased directly from Amazon and they are usually available in both brand new and pre-used conditions.